Researchers at the University of Pennsylvania School of Medicine are the first to observe and measure the internal motion inside proteins, or its “dark energy.” This research, appearing in the current issue of Nature has revealed how the internal motion of proteins affects their function and overturns the standard view of protein structure-function relationships, suggesting why rational drug design has been so difficult. 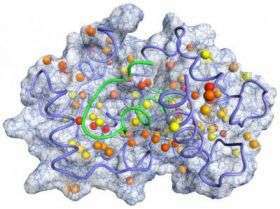 Proteins are malleable in shape and internal structure, which enables them to twist and turn to bind with other proteins. “The motions that we are looking at are very small, but very fast, on the time scale of billions of movements per second,” explains Wand. “Proteins just twitch and shake.” The internal motion represents a type of energy called entropy. Current models of protein structure and function used in research and drug design often do not account for their non-static nature. “The traditional model is almost a composite of all the different conformations a protein could take” says Wand. The researchers measured a protein called calmodulin and its interactions with six other proteins when bound to a protein partner one at a time. These binding partners included proteins important in smooth muscle contraction and a variety of brain functions. Using nuclear magnetic resonance spectroscopy, the investigators were able to look at the changes in the internal motion of calmodulin itself in each of the six different protein binding situations. They found a direct correlation between a change in calmodulin’s entropy –a component of its stored energy – and the total entropy change leading to the formation of the calmodulin-protein complex. Finding out the contribution from individual proteins versus the entropy, or movement, of the entire protein complex has been more difficult and has been overcome in this study. From this individual contribution they deduced that changes in the entropy of the protein are indeed important to the process of calmodulin binding its partners.